This cool tangle, Boze, comes to us from tangler Jan Steinle who hails from the beautiful city of Pittsburgh PA. Boze is Jan’s first tangle pattern on the site. In this introduction Jan tells us how Boze came about and that she’s headed to Providence RI in April to become a Certified Zentangle Teacher. I started my journey as an artist about 40 years ago when I attended Art School in Pittsburgh, PA, where I’ve lived almost all my life. (Married my high school sweetheart in 1978.) For several years after graduation, I worked in art-related jobs I loved. Then I moved on to other things to earn more money. About 15 years later, I tried scrapbooking for awhile (loved that too), about 10 years after that I co-owned a custom picture framing shop (wonderful creative job launched at the beginning of the recession…), and then in recent years I took a couple of painting classes and did very well. This past summer was I introduced to Zentangle® through my sister Carole, and immediately became enthralled (more like obsessed) … I haven’t stopped tangling since, and I’m proud, once again, to call myself an artist. Can’t wait to go to CZT Training this April! My new (first ever) pattern, Boze, came to me as I was drifting off to sleep one night. I chose the name because of course there are shapes in it that look like bows, but I don’t want people to get attached to that aspect of it, so I changed the spelling. The more I played around filling in the positive and negative spaces, and the direction of the ‘ties’, the more options for pattern variations I came up with. I hope everyone who tries this pattern has as much fun as me! Boze belongs to a family of bold, high contrast tangles; Barbara Finwall’s (barbaraf) fall into that category. 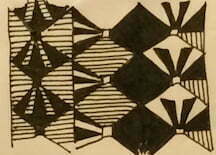 These tangles provide a very striking look to your Zentangles. Jan shows several potential variations of Boze below and I also tried out this version, simply reversing the direction of the “ties” in the center column. 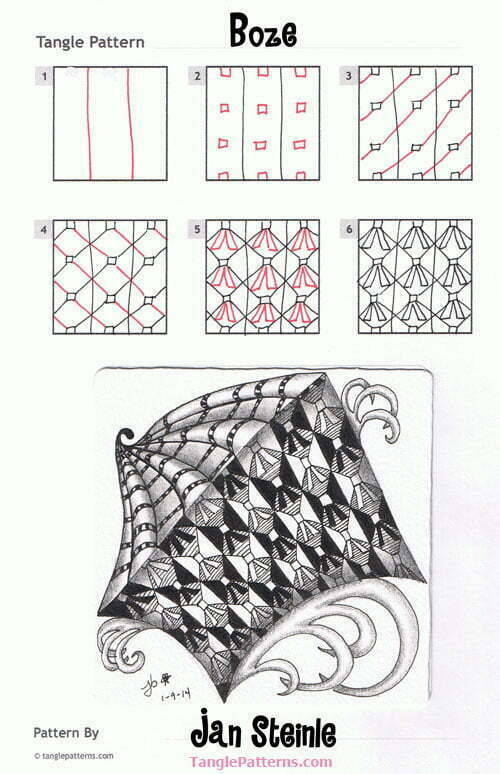 Jan illustrates the step-by-step instructions for drawing Boze here and she includes a lovely Zentangle featuring her tangle. Excellent shading! Check out the tag jans for more of Jan’s tangles on TanglePatterns.com. You can also find her on flickr as janbee.steinle. Get your free email subscription and never miss a tangle! Sign up to get new tangle postings delivered free to your inbox by email in just 2 easy steps. Visit the ABOUT > SUBSCRIBE TO FREE TANGLEPATTERNS EMAILS page on the top menu bar for more information. Need to change your email address for your subscription? Visit the ABOUT > HOW TO CHANGE YOUR EMAIL SUBSCRIPTION page. Cute, cute, cute! Thank you for sharing, Jan! I love this tangle and enjoyed Jan’s inspirational life path! Thank you Jan for this amazing and versatile tangle and of course a huge thank you for you Linda for providing us with all the newest and wonderful tangles and for all your time in keeping your site going! Much love to all! Creativity makes my soul smile and I am smiling a lot right now! Jan, love the dimensionality of your tile! I am new to this and have no artistic background, so work like this really impresses me. Thanks for the heads up re Pinterest also. I’m have an account, but never got the hang of pinning or sharing images (just a lookie-loo), so I guess I won’t be starting now. Jan, I can’t wait to draw this tangle. I grew up near Pittsburgh (Washington, PA) and still have family there. My husband who grew up in CT loves to visit my family there. Its a great city.